Our conservatories are an all year round extra living space. They come in all sorts of colour varieties met to your specification. Our conservatories come in different styles and shapes. They also come in different roof types such as gable roofs, hipped roofs, lean-to roofs and many more. To make your conservatory unique, some of the door options are French doors, patio doors, and bi-folding doors. Conservatory roofs come with range of glazing options from polycarbonate panel to different types of energy rated and self cleaning glass. 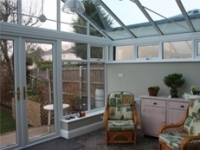 We carry out the complete building work involved in your conservatory. All conservatories have footings and fully insulated bases as standard. Depending on the type of conservatory we build dwarf and full height wall to match your existing house or to stand out with brick, render, pebble dashing or cladding finish. The build includes the finishes and services, such as plastering, electrical work and heating.